We’re shaking off the shadows of winter and leaping straight into the joys of spring here at The Liberty with a celebratory spring spruce-up! Our 100+ stores have all the essentials for an effective spring clean, while we have some handy hints and tips to make your chores, well…less of a chore. Need a new hoover to tackle the task at hand? Why not use something simple and effective that doesn’t have Henry in its’ name? This Vax Air Lift Pet Upright Vacuum from Next (£180) comes with a 6 metre cord and weighs only 4.9kg, saving you the trouble of hauling a huge vacuum around the house! 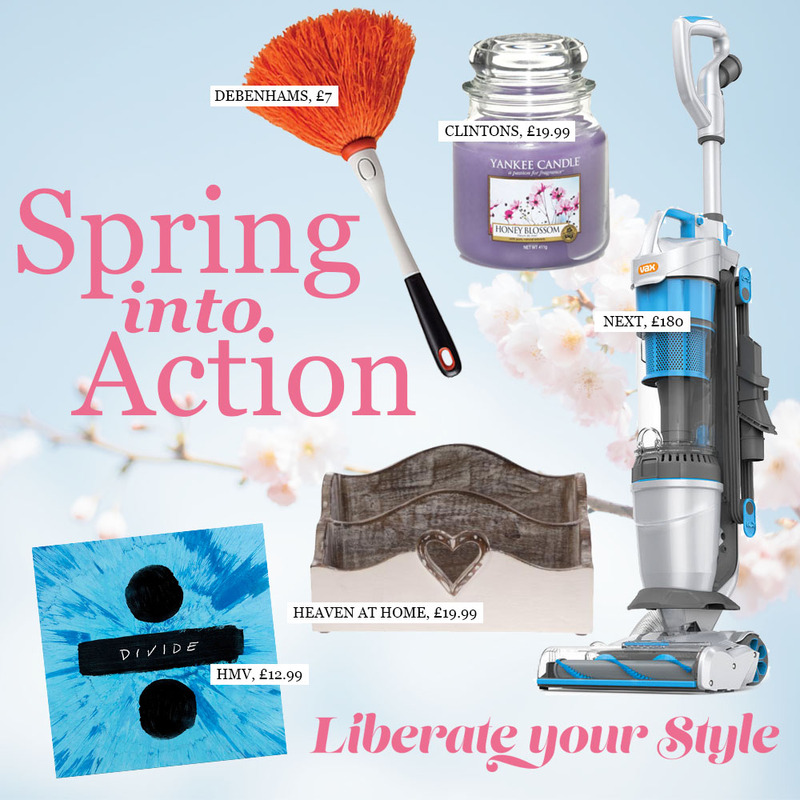 The Liberty Top Tip: Sing Along – Housework doesn’t always have to be boring! While you’re using your new vacuum for the living room and stairs, why not put your favourite album on! We currently have Ed Sheeran’s new album Divide on repeat, you can get it at HMV (£12.99). Stains are always the toughest part of cleaning, especially those hard-to-shift marks on your cooker top. We recommend you say goodbye to them with JML Doktor Power Magic Eraser from Debenhams (£11.99). These reusable household erasers are perfect for hobs and other surfaces, such as chrome, paintwork or wood, keeping your home stain-free. The Liberty Top Tip: Keep it Comfy – No-one likes to do house cleaning in ‘proper’ clothes… get those slippers and pyjamas on and feel comfortable while cleaning to make yourself a little more relaxed! Ever thought that everything is nice and clean and then you spot dust still lingering around? We suggest you channel your inner Cinderella and dust those nooks and crannies with this OXO Good Grips Delicate Duster from Debenhams (£7). The microfiber strands trap and hold dust instead of it flying off and landing somewhere else. We love it in orange as it adds a cheerful pop of colour to our chores. The Liberty Top Tip: Open the Senses – Instead of cleaning and leaving the house smelling of bleach and surface spray, bring the sent of spring inside with Yankee Candle in ‘Honey Blossom’ (£19.99) from Clintons; this scent contains flower nectar, honey musk, freesia and woods to make this the scent of the season. Spring cleaning isn’t all about dust and grime, it’s about getting organised too. Stacks of bills and paperwork to sort out? No problem – Heaven at Home has the perfect solution with this Sass & Belle Wooden Heart Letter Rack (£19.99). Not only does it look lovely, it’ll help you to keep on top of all of your important correspondence too. For more inspiration and ideas, from fashion to home, don’t forget to follow us on Facebook, Twitter, or Instagram.